Bound with a collection of histories and documents relating to the Cistercian Abbey of Hailes, in Gloucestershire, the Chronicle of Hailes covers the period from Brutus--the Brut of medieval literature, a Breton who founded the kingdom of the Britains--to 1314, during the reign of King Edward II. 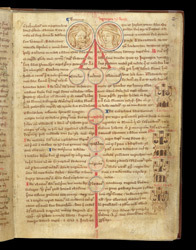 The chronicle gives an account of the acts of Brutus and provides a genealogical diagram. At the top are portraits of Brutus, of Trojan descent, and Ignoge, his wife, formerly a Greek princess. Names of their descendants are given on the discs below. In the right margin, castella--walled towns--of Britain are illustrated with images of fortified gates, with London at the top. Information for the Chronicle would have been taken from the library at Hailes, from works such as the histories of Geoffrey of Monmouth and Gerald of Wales.